Spring is just around the corner! Celebrate with a burst of bright green with this refreshing and delicious Mediterranean salad recipe! White beans are loaded with antioxidants and while also supplying detoxifying molybdenum, fiber and protein. They not only help eliminate toxins, these little powerhouses also reduce several cancer risks and deliver phytochemicals and flavonoids that can diminish the growth of cancer cells. Did you know tomatoes are considered a high-antioxidant food and one of the best sources of the phytonutrient lycopene, which is closely tied to enhanced immunity and cancer risk reduction? Research has long demonstrated the health benefits of spinach, with studies showing an inverse relationship between spinach consumption and almost every type of cancer. It’s the rich supply of vitamins, minerals, omega-3 fatty acids, antioxidants and phytonutrients that do the job. The folate in spinach also helps the body produce new cells while repairing DNA. 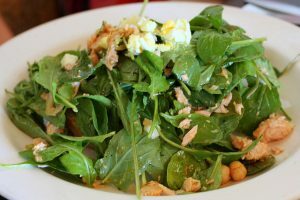 This salad recipe is perfect for a light meal and is versatile enough to accompany just about any main dish! 1. In a large bowl combine beans, red pepper, sun-dried tomato, basil, olive oil, lemon juice, and garlic. 2. Stir in the bag of spinach and add salt and pepper to taste. 3. Top with crumbled Feta before serving (omit for dairy-free).